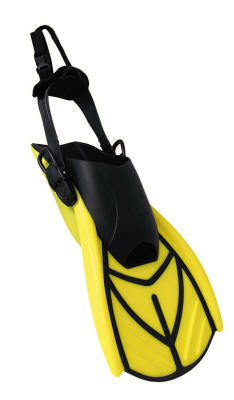 Aqua Lung Shredder SAR Fins | Scuba Center | Popular for Public Safety / SAR applications. Scuba Center is an authorized Aqua Lung Dealer. In addition to traditional diving equipment, Aqua Lung has a full line of equipment for the surface, tactical, water rescue, and SAR swimmer. Aqua Lung performs product research and development, test and evaluation, manufacturing, assembly, packaging, distribution and management for specialized military and professional products. In the early days they were known as U.S. Divers Co. and were located in Santa Ana, CA. This division is now headquartered in Vista, CA and is the leading provider of maritime solutions for life support products and services for the US Department of Defense, State and Municipal Governments, and many International Military commands. Although they are a member of an international organization, Aqua Lung is truly a United States based manufacturer. Provides explosive thrust and exceptional maneuverability. Ultra-light techno polymer blade provides optimized power and snap with up to 50% less weight and bulk. Hydrodynamic Natures Wing ® split blade design provides efficient water flow for improved thrust while greatly reducing ankle and leg fatigue. Increased speed while conserving energy for maximized endurance, greater sprint durations and longer surf sessions. Adjustable buckle provides customized fit for maximum comfort, leverage and power while eliminating “slop” and chaffing. Padded, quick-release leash system secures fins on feet even in huge waves. Incredibly soft foot pocket and heel pad provides excellent comfort. Works with wetsuit boots and larger style drysuit boots (Aqua Lung EVO4, DUI Rockboots, etc).